1. Thoroughly wash and peel both ginger and turmeric roots. Slice them horizontally and then vertically giving you long and thin strands of ginger and turmeric. You can chop in any other size of your choice too. 2. 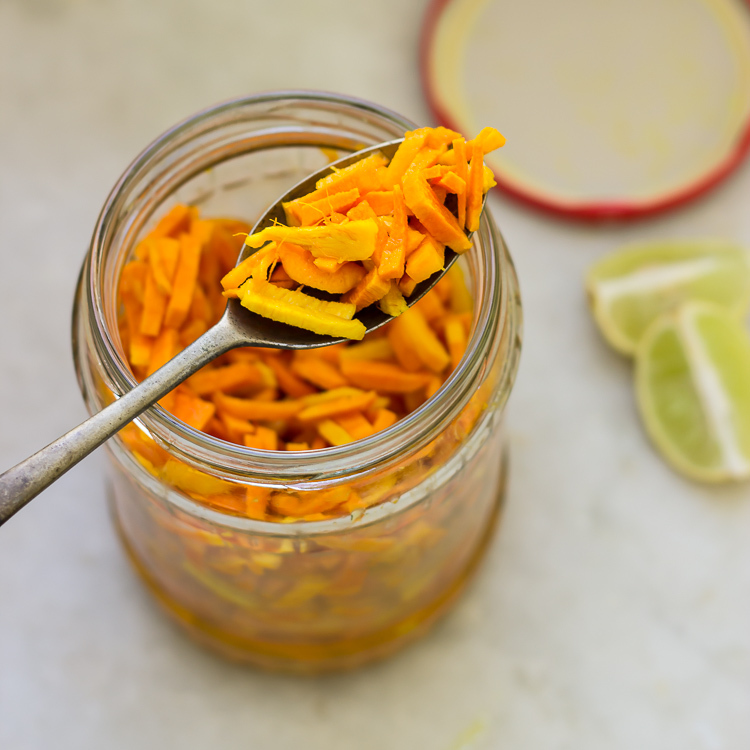 Place the chopped turmeric & ginger pieces in a clean glass jar. Add salt and lemon juice. Mix well and keep aside. Allow the pickle to absorb flavours from salt and lemon juice. The longer it sits, the better the flavour is. Usually 3-4 hours is a good time for it to become flavourful. Serve little with your meals. Recipe from a friend (Rekha). It stores well in refrigerator for up to 6 weeks. You just need to keep moving the pickle around in the jar every other day, so that lemon juice doesn’t settle down, leaving the top layer dry and without juice. Your hands will go yellow for 1-2 days, but there is really no help for it.